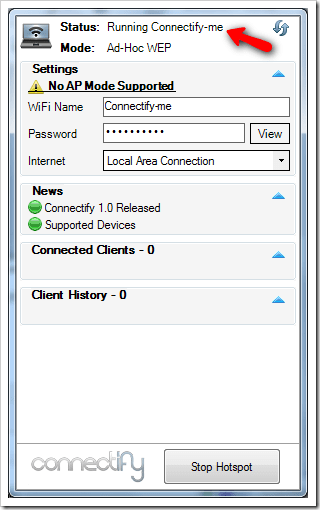 Connectify, a software that turns Windows 7 laptop into a WiFi hotspot, opened their first beta in Nov 2009. We had blogged it and questioned that if we really need a software that does something that’s already baked in the system. 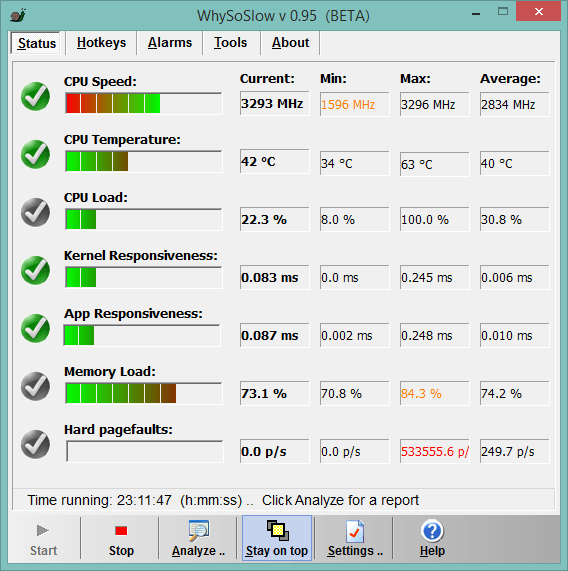 Now, with the version 1.0 officially released, it gives me at least one reason to use it. The main complain I had about the native virtual wireless and Connectify beta is that they only work on the certified wireless driver. If your wireless cart is not supported, you won’t be able to use this neat technology. Access Point mode allows you to actually share a WiFi connection from the same WiFi card that you are using to access the WiFi network. 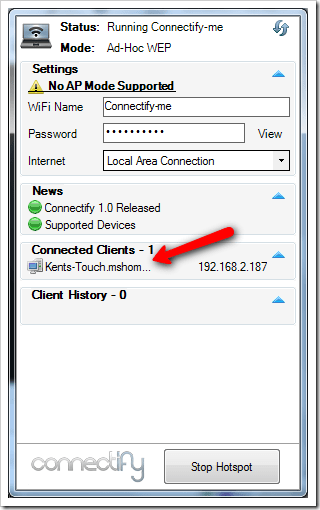 Ad Hoc mode needs the Internet connection to come from another card (Ethernet, cellular or a second WiFi card in your computer). For example, my wireless card on my laptop is not Windows 7 certified. In order to make it as a WiFi hotspot, I need to Internet connection from other source, such as my Ethernet port. Let’s see how it works. Launch the control panel from the system tray, you will noticed in my case that AP mode is not supported. So I had to go with Ad-Hoc mode. 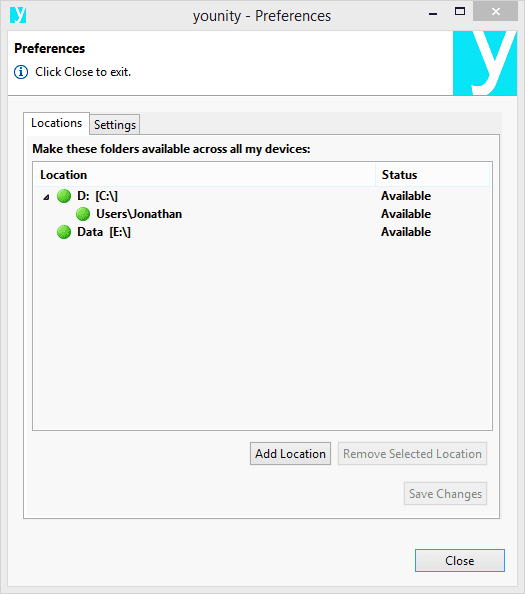 Give a name to the WiFi hotspot with a password, and click Start Hotspot button to start. A few seconds later, my laptop becomes a WiFi hotspot that’s ready to accept the connections. A message will be popping up in the bottom right corner when a device gets connected. The connected device will also show up in the control panel with a bit of more information. 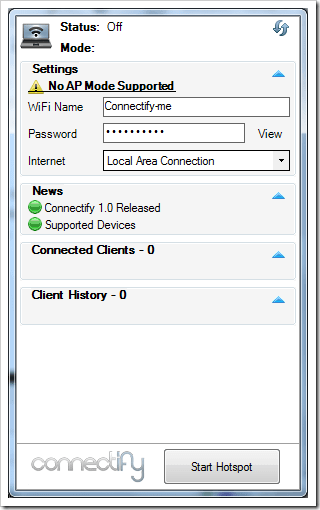 The version 1.0 does look promising and works much better than its beta version, and this ad-hoc mode used for non-supported wireless card makes the software a much better replacement to the native virtual WiFi that’s built in the Windows 7. The best part, it’s still FREE. Having a capability of making your laptop a hotspot makes possible building a wireless personal area network on the road, as Alex Gizis, CEO of connectify, pointed out in an email sent to us. With Connectify individuals can now have their own wireless Wi-Fi networks that follow them, and let on whoever and whatever they want. It is sharing your Internet, but it’s also wireless LAN parties with friends, wireless printing without a router, file sharing on a train, and sending pictures from your camera to flickr without wires. I really don't know why people keep touting this utility, it does not work with the IBM wireless mini card that is in a huge percentage of all laptops sold. Not sure if you read the whole post. Connectify has released its first official version that supports all types of WiFi, including Intel wireless mini card. The only difference is that for those Windows 7 certified cards they can run in both Access Point mode and Ad-Hoc mode but for those not certified they can only run in Ad-Hoc mode. Try it out. I have a windows 7 HP touchsmart computer. I downloaded the connectify on this computer. The only option given was AP WPA2-PSK. My laptop is a DELL with a 1309 minicard. My laptop connects but I can’t get to the internet. I have tried just about everything but I just can’t get online. Any suggestions? I need help here Im tryin to connect my psp using connectify but the wpa2-psk not supported on the psp do how to change the access mode point ??? ?